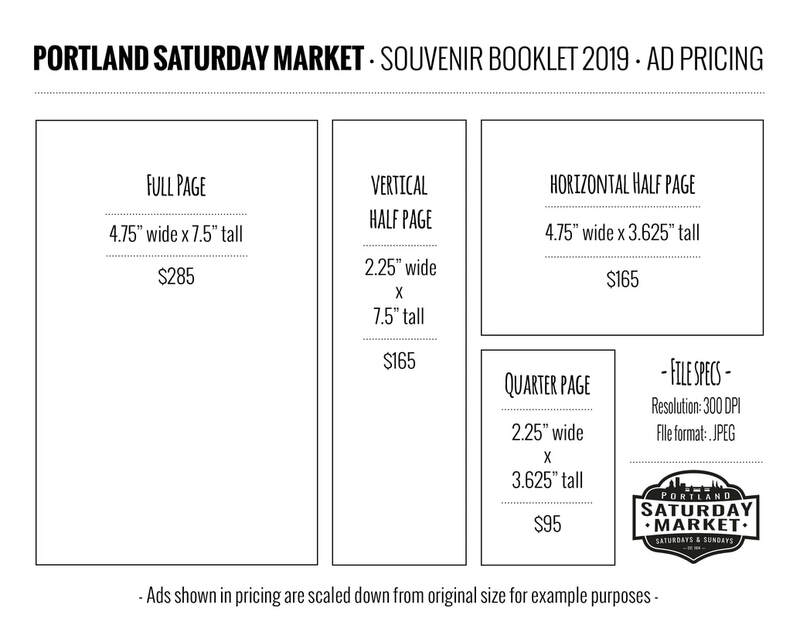 Thanks for participating in the 2019 PSM Souvenir Booklet! Follow the steps below to register for your ad space. Step 1: Check out the ad specs information below to help you decide your ad size. Step 2: Register for your ad space here. Step 3: Pay for your ad space at the info booth with a separate check or separate cash payment. (Let staff know it is for your ad and not to be applied to your regular account.) The information booth will give you a separate receipt for your purchase. Be sure to keep this receipt as it is proof of your ad purchase. Payment due by December 21st as the market office will be closed for a couple weeks over the holidays. ​Ads due January 11th, 2019. File Specs 300 dpi, CMYK, jpeg. point you a direction that can provide support for a basic ad. Go to the link below for a tutorial. You can also enlist help from the Souvenir Booklet team. Email us at psmsouvenirbooklet@gmail.com to get started.